Since you're all busy thinking up gadget ideas, I figured I should share a cool invention that I happened across the other day. It's unbelievably simple--yet truly ingenious. It's called the Anti-Theft Lunch Bag. 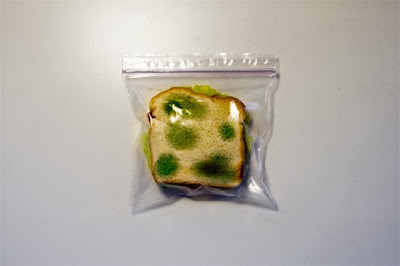 Simply place your yummy sandwich inside, and your food will appear moldy and disgusting. No matter where you leave it, you can be 100% certain that no one's gonna take it! Just goes to show you that an invention need not be complicated to be a winner. yeah...except who would go so low as to steal a sandwich??? Lara: Just wait. If you ever work in an office, you'll see just how low people can go. You don't even need to work in an office. .. You can simply live with annoying family members who attempt to steal that last piece of sliced roast beef. I can see one flaw with that. Yes your lunch won't get stolen but there is a definate possiblity it could get thrown away. But probably not if it's in your backpack/briefcase. That's so wicked! I've had my lunch stolen once.